Liam Hill takes the men’s final. 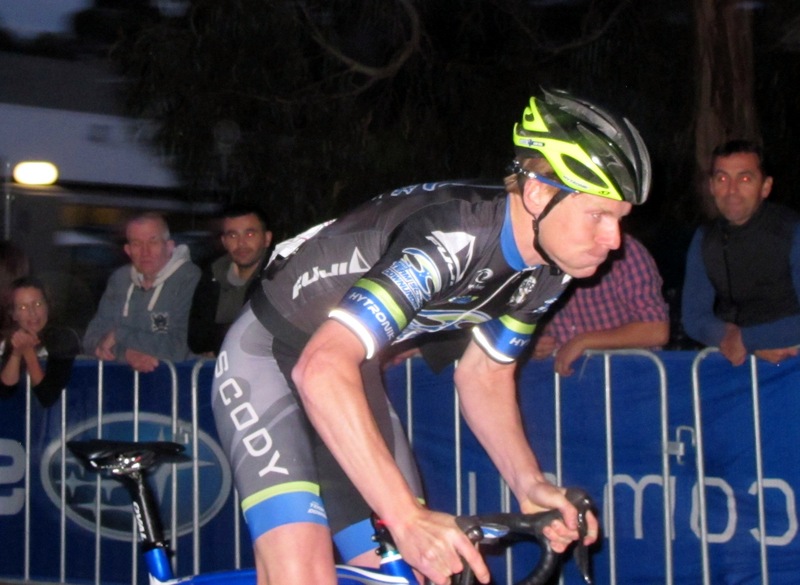 Victoria scored a new event on the weekend with the inaugural Amy’s Wall hill climb in Lorne. It was a great event – dusk against a glassy Louttit Bay, closed road, lights, timing and a short Strava segment as 5000 cyclists settled down for Amy’s Gran Fondo and National Road Series race Amy’s Otway Classic next day. Entry fees were donated to the Amy Gillett Foundation. Two-up heats sorted out the finalists as the crowd grew and the light faded. Peta Mullens won the women’s heats with 18.262s but lowered that to 18.103s in the final, ahead of Chloe McConville and Katrya Crema. Lynton Zawadzki had the fastest men’s heat time (14.781s) but Liam Hill backed up best in the final to stop the clock at 14.460s, ahead of Kelland O’Brien with Zawadzki third. There’s sure to be lots of action on the climb from now on. This entry was posted in Racing, Women's cycling and tagged women's cycling, women's racing by quaddess. Bookmark the permalink.